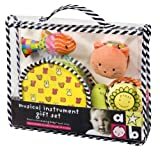 This first band set includes a rattling soft sided tambourine, press musical snail that plays “You Are My Sunshine”, fish maraca with ribbon accents and kitty castanet. All sized for babies to use easily. Packaged in vinyl gift bag. I bought this for my 16 month old nephew and I think it is more geared for under 6 months of age..the materials are very soft and the noise it makes arent very loud. He didnt seem to be interested in them AT ALL. Also the packaging it was in was bent on one side, and because it was sort of a clear vinyl I couldnt bend it back :/ The toys themselves were fine..but giving this as a gift, it made it look cheap. This page and all the pages on this site generate income for the owner and charities based on affiliate relationships with our partners, including Amazon.com, Google, eBay and others. Get deals and have fun!